George Reinas with Cops Plus bringing you a product from Galco. It's a shoulder holster, and it's known as Miami classic. 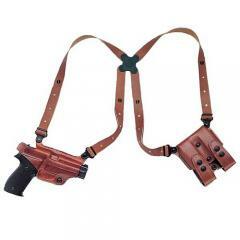 It is by far the most popular shoulder holster that's on the market today. First off, constructed of the highest quality leather out there. It's got a sleek look, it looks great. Every single component on here, whether it be the magazine holder or you got the holster here itself. You got the premium leather connected together with the back straps. Now, while focusing on these leather pieces here, they've got the tensioning screws from Galco, which are great. You can go ahead and as the holster breaks in, you can adjust the actual tension so ease of use is always going to be there. Especially important for your duty pistol if you're going to go ahead and pull it out of this thing. Connecting all the stuff together is the spider harness. Galco is obviously trademarked signature is this clover-shaped harness here. It's a pivoting harness that basically molds to anyone's body. No matter what shape you are, if you're a big guy, if you're small, petite, all these straps going to go ahead and pivot and they're going to go ahead and conform to your body. Strapping into it is a breeze. Go ahead and pick it up, put it on. Once you've got your harness on, take these top straps, move it around, it's going to settle into you. It's going to hang nice and free. If you got your jacket, obviously it's going to be hanging over here. It's just going to sit down and be in the perfect spot for you to go ahead and draw. Now, whether you have the tie downs in place or not, going to draw, the quick snap almost no effort whatsoever. The thumb break breaks clean, nice and crisp. You're not guessing if it's half open or not, you know it's good, allowing you to pull out, deal with the situation with ease. Accessories available for this holster are the tie downs. You have a magazine tie down, you also have the holster tie down. As you can see here, the tie down's going to attach to this loop here, which is fully adjustable so while you're moving, while you're walking, it's going to conform to your body. It's going to attach to your belt. If you have these pants on, it can even attach to here, or wherever you choose to attach it. The bottom line, it's going to stay secure where you want it to. Now, it's available in black and tan, which is good for uniform departments, depending on what kind of style you want to have. Also, one of the great things about it, it's made in the USA, which is always awesome. Another great product from Galco. They really knocked this one out of the park.